The Zombie March happens every year as part of Spooky Empire's Ultimate Horror Weekend. This year the convention of horror was being held at the DoubleTree By Hilton at Universal (5780 Major Blvd. Orlando, FL). This is right across the street from Universal Studios which is perfect if people wanted to check out Halloween Horror Nights at Universal. The Zombie March was scheduled for 4pm on Friday October 25th at Hooters which is about a quarter mile north.of the Double Tree on Kirkman. I arrived about an hour early and zombies were milling around in the parking lot. Two zombies stood curb side moaning and flailing at passing buses. It was hot in the sun although temperatures are just starting to dip in Orlando. 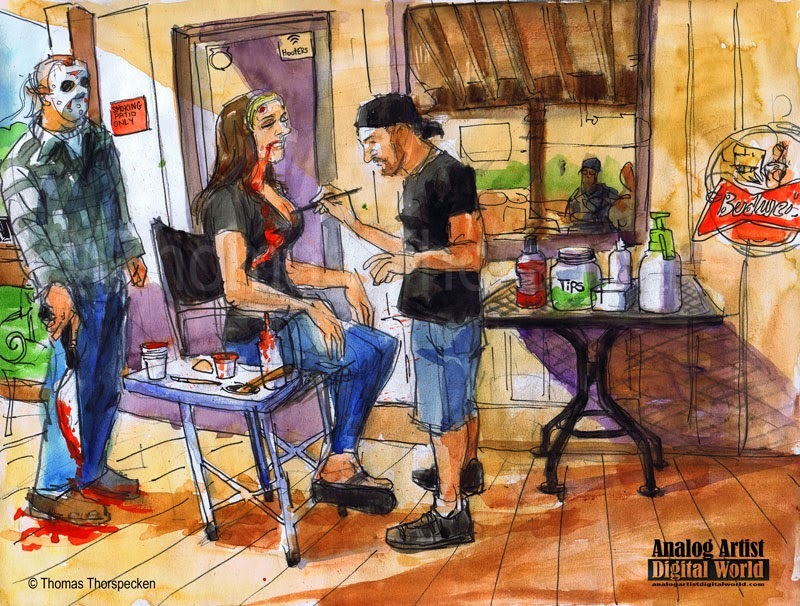 Make up artists were set up on the Porch of Hooters transforming people into zombies. I sat at a table with a sheriff whose facial skin had been ripped off leaving red bloody pulp in its place. We talked for a bit. He has been coming to Spooky Empire for the past four years and he has seen the convention grow exponentially. He said that the money spent on alcohol probably has kept the convention growing. Attendees can rub shoulders with stars of horror. For instance he bragged that he got to chat with Shannen Doherty one year at poolside. He told me that the make up artist at the far end of the porch was doing the most detailed work, so I thanked him and moved closer to sketch the artist at work. He was busy adding bruising to the cleavage of a woman who had on a Wonder Woman T-shirt. He had her tilt her head back and then poured blood down her cheeks and neck. Her skin was chalky white and there was a bite wound on her forehead and breast. Zombies don't understand social boundaries when it comes to feeding. Jason stood rock still watching the make up artist work. Talk powder was added to her hair so she looked like she just rose from the grave. Wonder Woman put on her red cape and vogued for photographers along with her friend who were all zombie super heroes. I was still sketching as the make up artist packed away his supplies. I should have come earlier to get several sketches. Zombies got riled up at the sound of a chain saw and they all began to shuffle down Kirkman towards the hotel. Several make up artists remained on the porch painting Day of the Dead ornate flowery skull make up onto the faces of Hooters waitresses. When they all were painted, they posed for photos, being sure to lean forward to showcase their exposed v-necked supple slopes.